That sign has been on that tiny little church at the SW corner of the UofA since time immemorial. This is the only time I’ve ever approved of tagging. Yep, and everyone that lives in the neighborhood says they’re really scary to have next door! I’m a big fan of tagging, as art. It makes walls so much better to look at. do you think jesus had all twelve of his disciples “submit” to his deisires? oh no, there goes tokyo. go go godzilla. 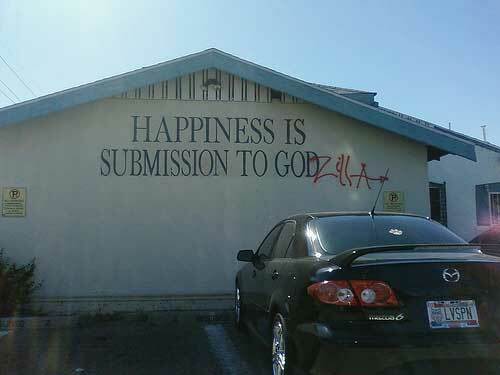 Well, I’d go with Cthulhu myself (better ritualistic orgies) but hell, Godzilla is a strong contender for my soul. It’s funny that a Christian would think that “happiness is submission to God” but would be so opposed to “submission to the will of God” (a.k.a. Islam).